The White House says Ivanka Trump will comply with ethics restrictions -- even though they don't formally apply to her -- now that she's getting a West Wing office. Those restrictions include giving up some income and limiting her exposure to conflicts of interest by minimizing certain assets and recusing herself from some policy matters. But ethics experts say the self-policing leaves a loophole -- and blurs the lines yet again between the Trump family, the Trump businesses and the Trump administration. "They keep pushing to these gray areas," said Larry Noble, general counsel of the Campaign Legal Center, a nonprofit, nonpartisan watchdog group in Washington. Even though the first daughter isn't taking a salary, she's still using government resources, Noble said, and should be required to follow the same ethics rules as full-time federal employees. "She looks like a government employee. She seems to be acting like a government employee," Noble said. "And the reason we have these ethics and transparency laws is not because of the label you put on somebody, but because of the function they serve." As Politico first reported Monday, Ivanka Trump will get security clearance and a West Wing office. The move further solidifies her considerable influence in her father's orbit. She was at a White House meeting last week with German Chancellor Angela Merkel, and she met with Canadian Prime Minister Justin Trudeau last month. She has also attended White House discussions with leaders in manufacturing and technology. Meanwhile, Ivanka Trump has resigned her executive vice president job at the Trump Organization, her father's business empire, and relinquished her salary there. She has also sold her common stock and dumped her investments in various technology companies. 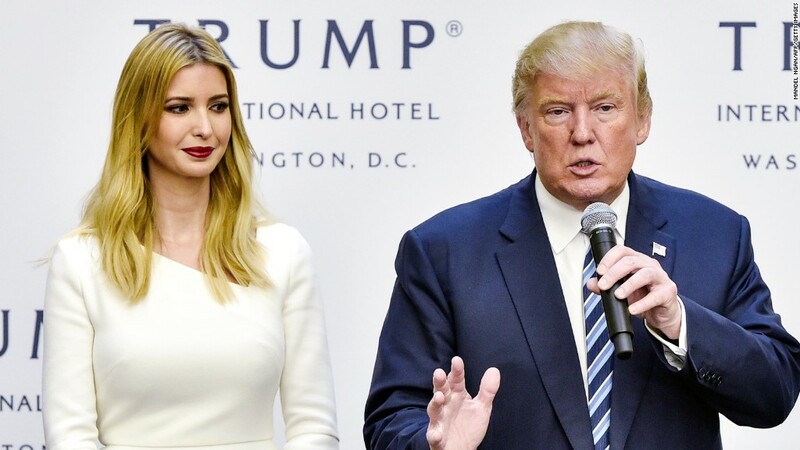 Her lawyer, Jamie Gorelick, told CNNMoney that Ivanka Trump has converted her stake in her father's company into fixed payments, which means she can't benefit from the financial performance of the Trump Organization. Gorelick said that decision was made with the advice of the Office of Government Ethics, the federal agency that works with executive branch employees to avoid conflicts. She did not immediately respond to a question about which stocks were in Ivanka Trump's portfolio. Ivanka Trump also stepped down from the management of her clothing and accessories business, but she kept her ownership stake and moved the assets into a trust. Gorelick said that was the best of a series of difficult options. She couldn't shut down the business because of contractual obligations, and selling it would mean someone could profit from Ivanka's name and likeness without her control, Gorelick said. "Her choices are not terrific," the lawyer said. At the White House, Ivanka Trump's role will be to advise her father and concentrate on issues related to women in the workplace, child care, parental leave and job training, Gorelick said. But Gorelick said her focus could change over time. She said Ivanka Trump is aware of potential conflicts and would be careful to avoid them. "If there were a trade agreement that was specific enough to focus on a tariff, for example, on textiles and clothing in a country where her clothing that is licensed by her brand is being made, she should not participate in that," Gorelick said. The concern is more than theoretical. A Harvard University professor who studied Ivanka Trump products found that hundreds were imported from China, a country her father has threatened with tariffs. It's also unclear whether Ivanka Trump will follow other ethics rules typical of federal workers. For full-time government employees, following federal code means filling out documents to publicly disclose financial entanglements. Many employees also pledge to divest any problematic assets or recuse themselves from cases in which they might have a financial interest. Gorelick deferred questions about whether Trump will supply a written, publicly available ethics agreement to the White House. When the White House was asked, it deferred to Gorelick. Gorelick also said Ivanka Trump would probably not fill out her own public financial filing. But she said her assets will already be disclosed in documents completed by her husband, Jared Kushner, a senior White House adviser. "It's not as if there's no public disclosure, even right now," she said. Noble, the ethics lawyer, said it's good that Ivanka Trump and the White House acknowledge the potential conflicts. But he said their plans don't go far enough. "They want to get the benefit of people who would traditionally be government officials and subject to transparency laws, recordkeeping laws, and yet keep them outside that loop," he said. "It's a dangerous precedent." If the White House claims that ethics rules are voluntary for Ivanka, Noble asked, where does it draw the line? "If a disclosure comes out later on about something that Ivanka Trump did, while adviser, that would violate the ethics laws, is she going to voluntarily make herself subject to penalties? Prosecution?" he asked. "They are asking for an awful lot of trust."